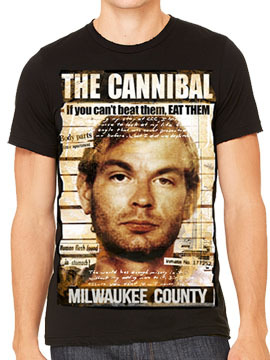 Killers Never Die The Cannibal mens short sleeve t-shirt features a large police booking photo of serial killer Jeffrey Dahmer and reads The Cannibal If you can't beat them, eat them Milwaukee County printed across the front. The back is solid in color. 100% cotton. light weight, standard fit. Color: black. Killers Never Die was founded in 2007 by musician/band Davey Suicide who's brand motto is We're loud, We're different, We're independent, We'll never die.